They are in continuous play. With the shapes, materials, spaces, fills, colours. 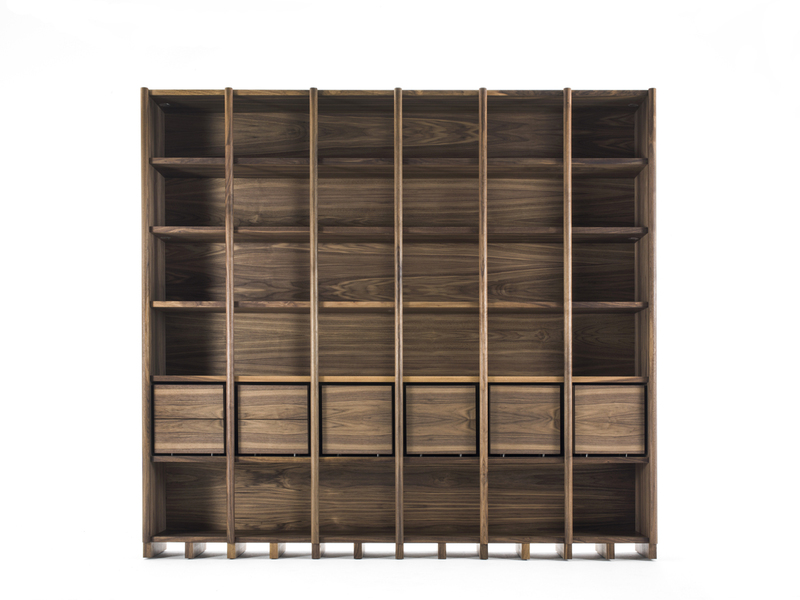 The new generation of bookcases are claiming all their potential and personality with designs based on the criteria of buildings and material experiments that go arm-in-arm with their cousin, architecture. 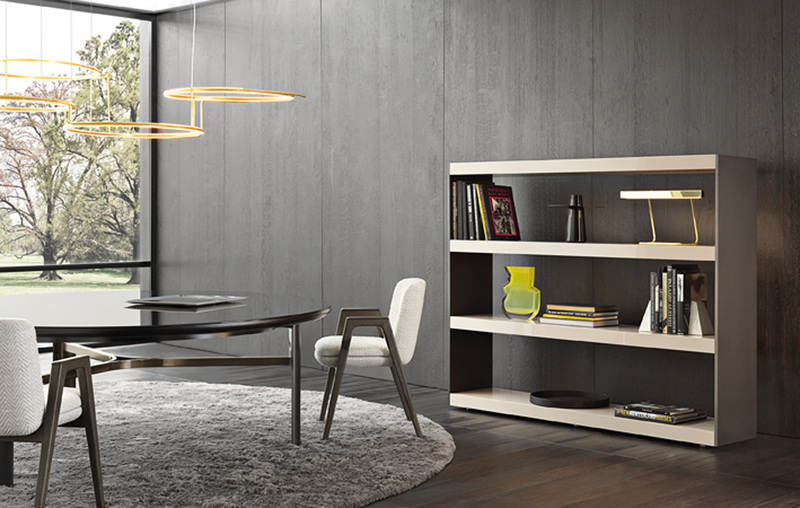 The requirements of contemporary spaces help them create settings that go beyond the ordinary. Separating rooms, for example, is no longer a structural a feature but is taking on the role of furnishings. 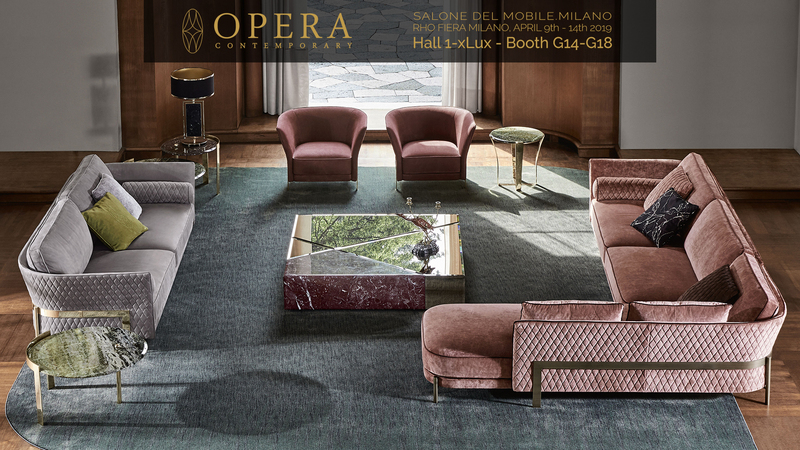 Alba of Arflex, designed by Bernhardt&Vella, thanks to its attachment by a single hinge on the metal structure, allows rounded compositions to be created, and the half moon in coloured glass, decidedly charming, does not forget its function of containing books. It is not by chance that Jean Nouvel, known for the buildings he has created throughout the world, has designed two articles with the strong character of construction that nevertheless retains a captivating aesthetic. 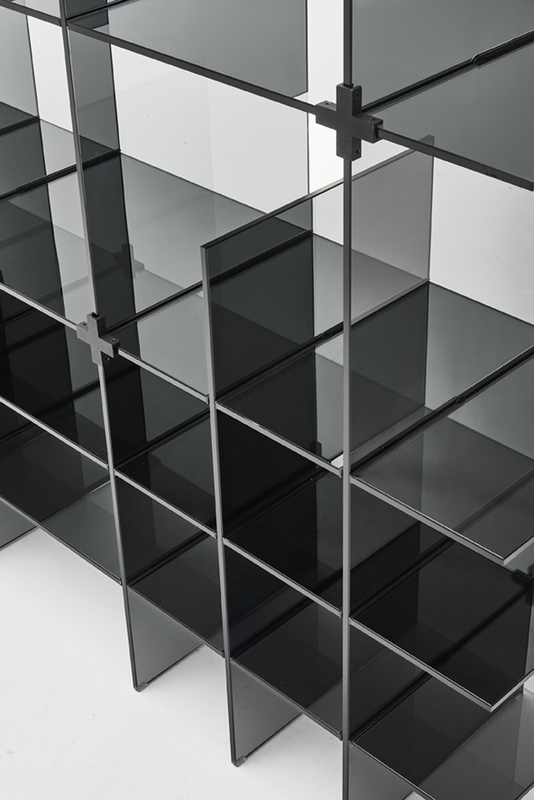 Ami-Verre, of Glas Italia, is made up of a single modular element in smoked glass and dark grey-black in 10 mm tempered paste, here, in a series of milled details, joints are inserted that enable slabs to interpenetrate, giving rise to an architecture of interlocking vertical and horizontal planes. The structure is finally reinforced and stabilised by metal stiffening elements placed at the junction points. 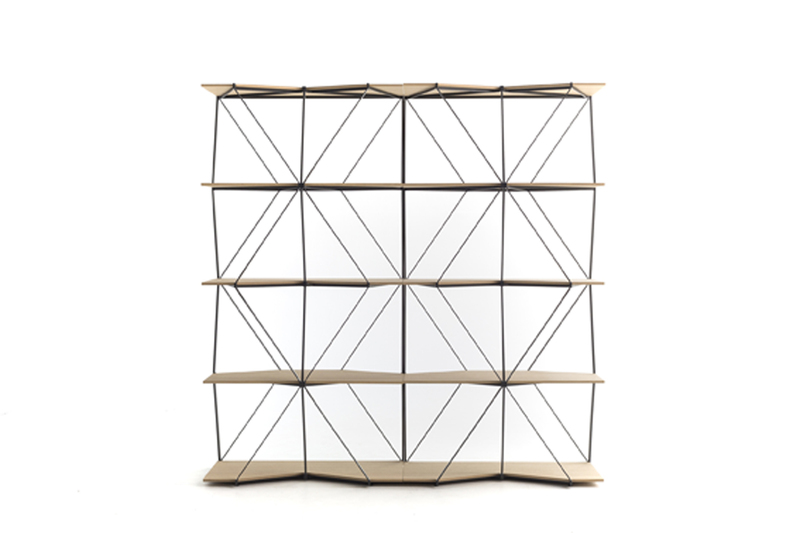 The architect also plays with graphics in Super_Position, produced by MDF. “The superimpositions are a paean to the lightness of horizontality,” he notes. “The planes, crossed by the discontinuity of the uninterrupted verticals, are little trampolines that project into the surrounding void. The objects, the vases, the sculptures can express their differences of scale in the empty spaces, in the niches at the centre or on the edges of the superimposed lines.” A collection that restores the company’s tradition of using aluminium and interprets it in matt varnished variants in different colours or with natural anodised brushed finishes. 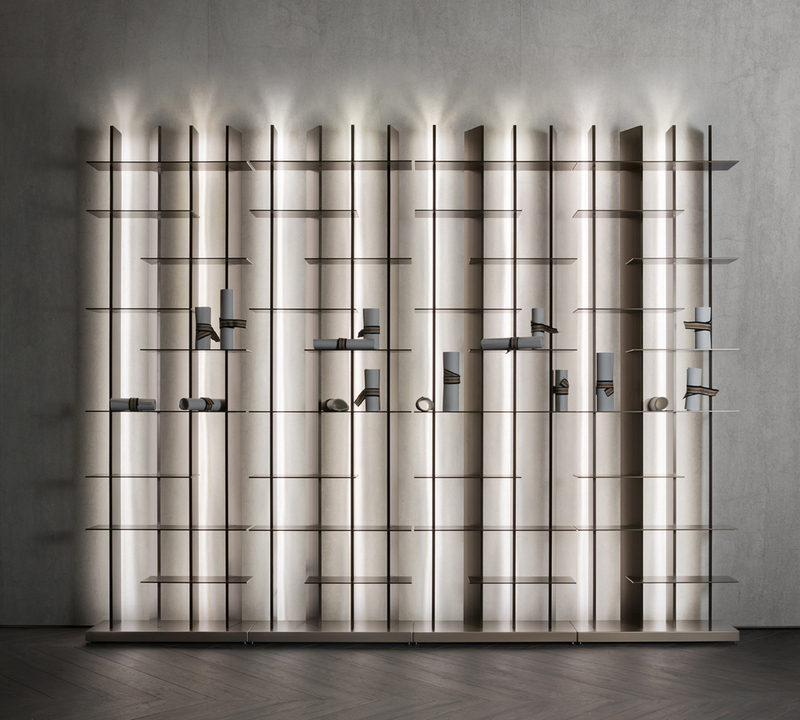 It is the thickness, on the other hand, that take centre stage in the Carson bookcase designed by Rodolfo Dordoni for Minotti: thin for the sides and thick for the shelves. 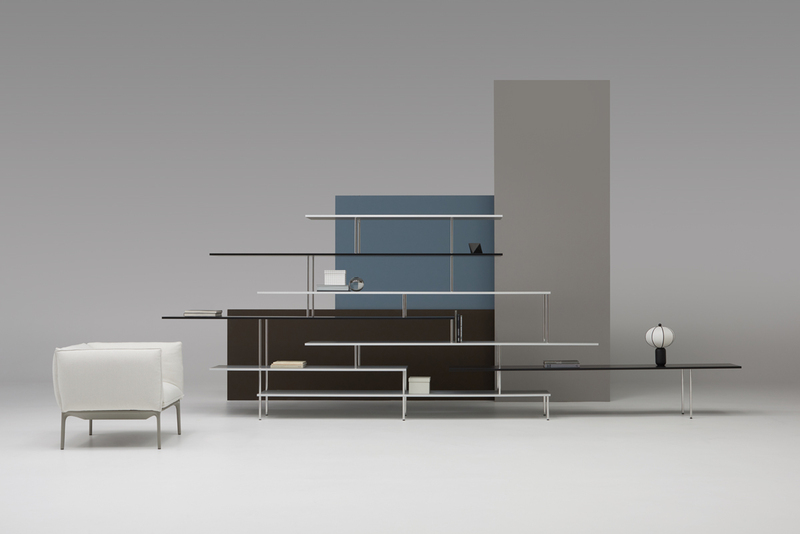 Perfectly finished at the rear, Carson also lends itself for use as a dividing element of a room, with the new Sand or Pewter coloured aluminium finishes, for the sides, and Liquorice coloured ash or glossy lacquered Sand colour, for the shelves. 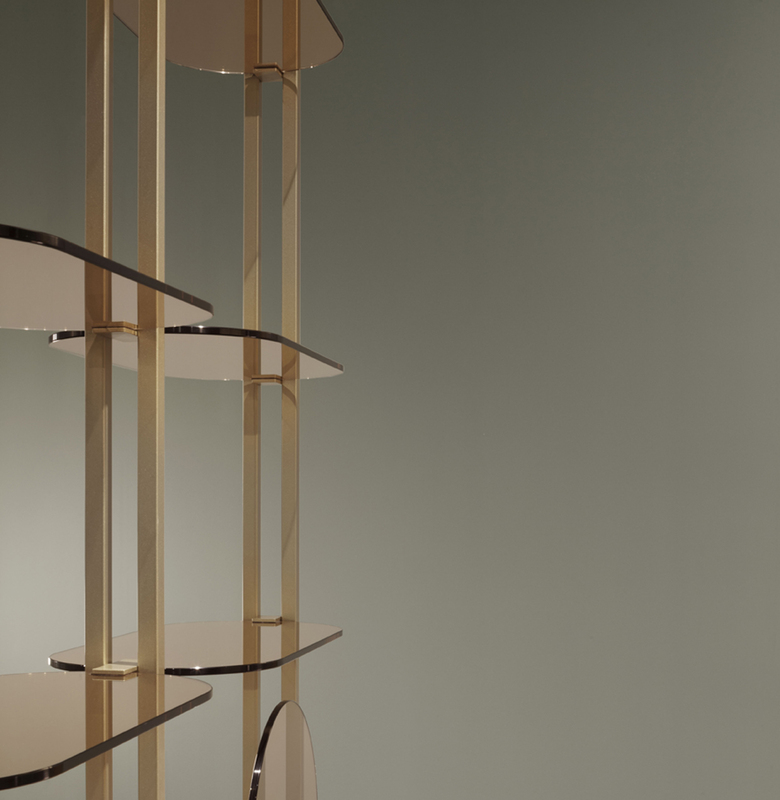 The CCLIGHT bookcase, designed by Carlo Colombo for Natevo, takes of spectacular forms, so pronounced is the architectural thought, in anodic bronze aluminium frames, lit, like a building at night, by integrated LEDs that diffuse a light comparable in intensity to a floor lamp. 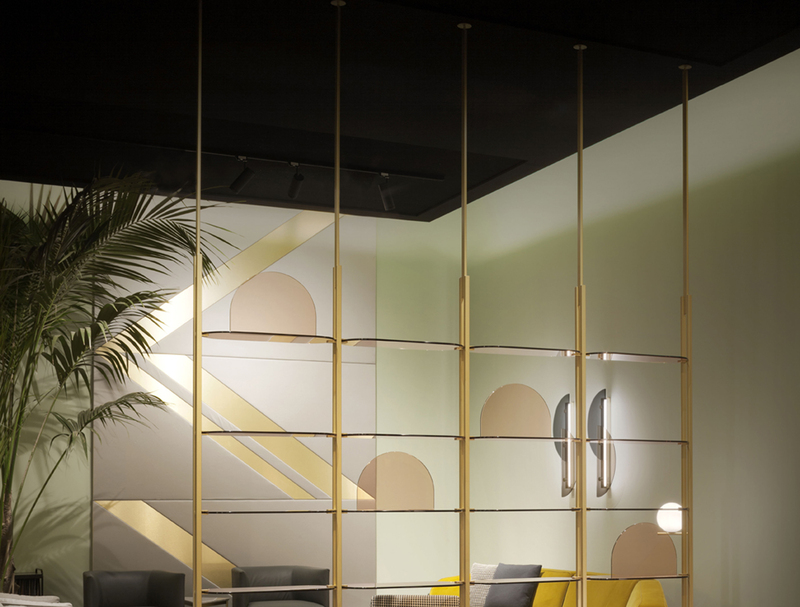 And Green Light, produced by Moroso with the creative spirit of the Danish-Icelandic artist Olafur Eliasson: a system of shelves with a geometric, reticular structure in multiplex and varnished steel, built around a space in negative with a rhomboid shape and delineated by the modules. Viceversa, Draga & Aurel for Baxter, also plays its part with a powerful visual impact from the slabs of shiny brass that clad the internal structure in aluminium and the undulating, ultra-light glass of the back to reflect the light. 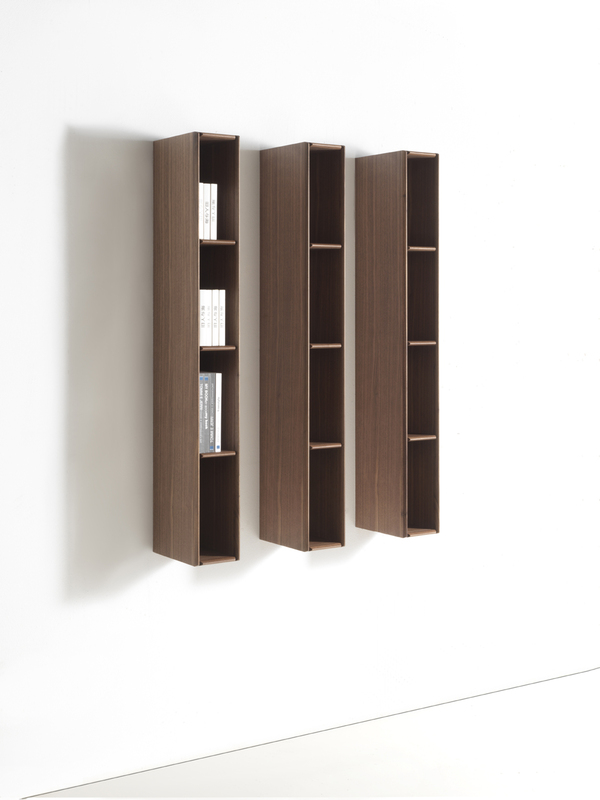 More rational, stylistically, but no less complex in design, is the use of wood in its many applications: Bayus, produced by Porada and designed by Gabriele and Oscar Buratti with open wall units in Canaletto walnut and frames in solid wood; and Biblio, in solid wood and plywood, featuring a system of modular backs and shelves and support base, was designed by Michele De Lucchi for Riva 1920 with extreme flexibility depending on the furnishing requirements that makes it possible to insert hinged doors and drawers assembled with dovetail joints and furnished with push-pull opening system.